This Caulerpa Prolifera marine macro algae species offers long blades which can grow up to 20-30 cm long. The fronds are attached to a thick rhizome which will attach itself to rock, gravel etc. 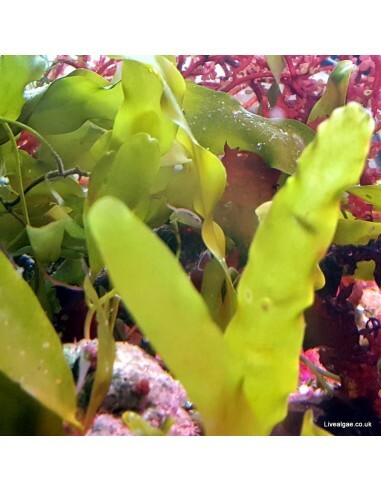 It is a medium fast growing species and will give a beautiful natural look to the marine tank. Caulerpa Prolifera can adapt better to various water conditions than for example Caulerpa Taxifolia. Caulerpa Prolifera needs just a medium strong lighting to grow well. Very rarely eaten, although some marine algae eating fishes might nip on it time to time. As this Caulerpa species will attach itself to rock etc. we recommend not to place it too close to your main rock, unlike you like to have it there. It needs some trimming and care. Great to keep in the sump as well for nitrate and phosphate export. Some Caulerpa species might go sexual, which means that it releases gametes and tissue into the aquarium water. Although this said, we never had in 14 years any problem with this algae species, and it was one of our first macroalgae we got. One thing to avoid this is good light and to remove pale turning parts of it. This algae eating is much harder than Caulerpa species and therefore there is a low risk anyway that it will go sexual. 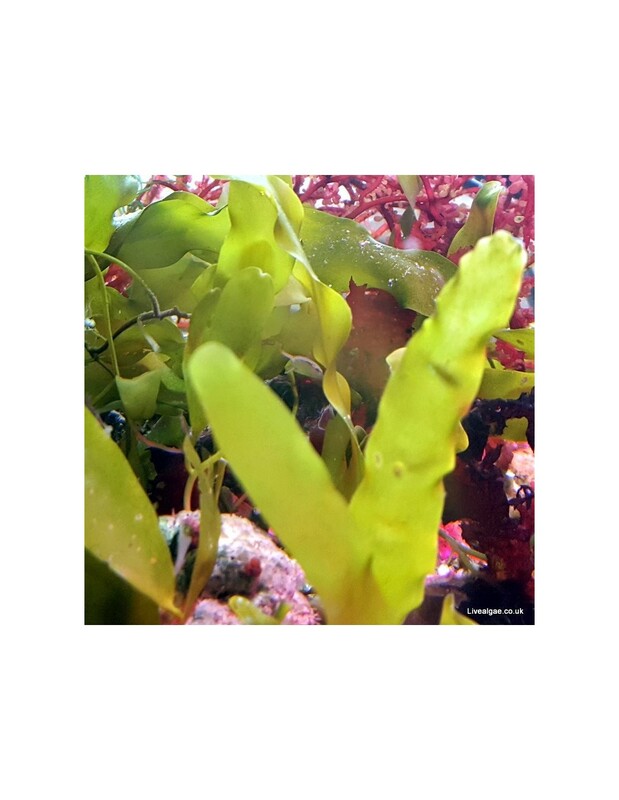 Like for most marine macro algae a higher level of Nitrate and Phosphate, in addition with the supplement of Iron, Magnesium and Trace elements will improve the growth of this algae. As it doesn't need very strong light it will do normally very well in the Aquarium Display too, but bear in mind that it will attach itself to rock etc. It provides great holdfasts for Seahorses. HI . For various reasons im giving consideration to swapping out the chaeto in my refugium for a caulerpa species , but before committing I have got a few questions . I was thinking perhaps Prolifera would be a good choice for a 1st time caulerpa grower as from reading it seems to be 1 of the hardier /more forgiving caulerpa species . what lighting schedule do you recommend for caulerpa ? can I attach it by gluing or rubber banding the rhizomes to pieces of rock ? what is the correct pruning / thinning technique ? Caulerpa Prolifera is indeed a very hardy macro algae species and a good caulerpa choice. Just bear in mind that it will grow just around half as fast as for example Caulerpa Racemosa. You could help for the start either to glue it with some common superglue or by using a rubber band to hold the rhizomes to a piece of rock. It will attach itself to the rock as well but will need a few days for this. This macro algae species is very easy to prune as you can just cut it along the rhizomes. I hope this helps and should you have further questions please let us know. My algea arrived well packaged and in good time. Lots of die back in the first few days, but after a week is bouncing back nicely. Thank you for the advice to keep it away from the main rock in my tank.\r\n\r\nIt adds a great natural look.